Our extensive research has shown that imitating the smart money can generate significant returns for retail investors, which is why we track nearly 750 active prominent money managers and analyze their quarterly 13F filings. The stocks that are heavily bought by hedge funds historically outperformed the market, though there is no shortage of high profile failures like hedge funds’ recent losses in Facebook. Let’s take a closer look at what the funds we track think about TransUnion (NYSE:TRU) in this article. TransUnion (NYSE:TRU) was in 28 hedge funds’ portfolios at the end of the fourth quarter of 2018. TRU investors should pay attention to a decrease in enthusiasm from smart money in recent months. 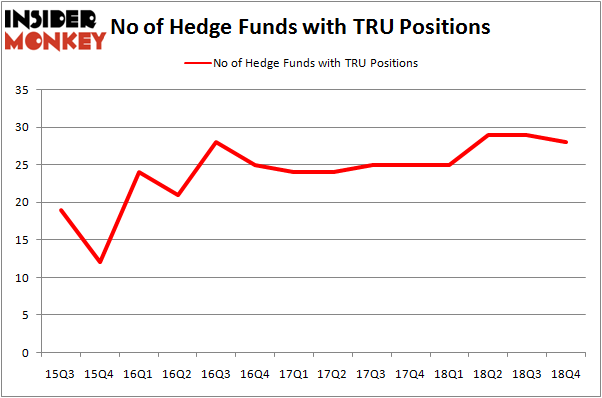 There were 29 hedge funds in our database with TRU holdings at the end of the previous quarter. Our calculations also showed that TRU isn’t among the 30 most popular stocks among hedge funds. Let’s view the recent hedge fund action surrounding TransUnion (NYSE:TRU). What does the smart money think about TransUnion (NYSE:TRU)? At Q4’s end, a total of 28 of the hedge funds tracked by Insider Monkey were bullish on this stock, a change of -3% from one quarter earlier. By comparison, 25 hedge funds held shares or bullish call options in TRU a year ago. With the smart money’s capital changing hands, there exists an “upper tier” of noteworthy hedge fund managers who were adding to their stakes significantly (or already accumulated large positions). Among these funds, Lone Pine Capital held the most valuable stake in TransUnion (NYSE:TRU), which was worth $575.1 million at the end of the third quarter. On the second spot was Farallon Capital which amassed $299.3 million worth of shares. Moreover, Egerton Capital Limited, Arrowstreet Capital, and Echo Street Capital Management were also bullish on TransUnion (NYSE:TRU), allocating a large percentage of their portfolios to this stock. Seeing as TransUnion (NYSE:TRU) has witnessed a decline in interest from the aggregate hedge fund industry, logic holds that there were a few funds that decided to sell off their full holdings last quarter. 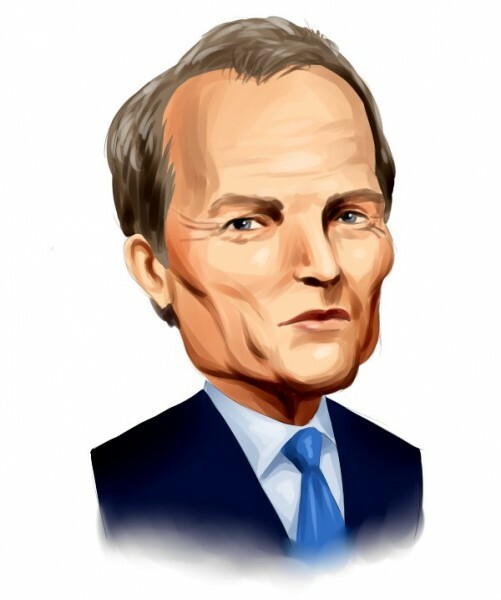 Interestingly, James Parsons’s Junto Capital Management sold off the biggest investment of the “upper crust” of funds monitored by Insider Monkey, valued at close to $51.1 million in stock. Ken Griffin’s fund, Citadel Investment Group, also dropped its stock, about $46.3 million worth. These transactions are interesting, as aggregate hedge fund interest dropped by 1 funds last quarter. Let’s now take a look at hedge fund activity in other stocks similar to TransUnion (NYSE:TRU). We will take a look at W.P. Carey Inc. (NYSE:WPC), Invitation Homes Inc. (NYSE:INVH), InterContinental Hotels Group PLC (NYSE:IHG), and Enel Americas S.A. (NYSE:ENIA). All of these stocks’ market caps are similar to TRU’s market cap. As you can see these stocks had an average of 11 hedge funds with bullish positions and the average amount invested in these stocks was $103 million. That figure was $1373 million in TRU’s case. Invitation Homes Inc. (NYSE:INVH) is the most popular stock in this table. On the other hand InterContinental Hotels Group PLC (NYSE:IHG) is the least popular one with only 7 bullish hedge fund positions. Compared to these stocks TransUnion (NYSE:TRU) is more popular among hedge funds. Considering that hedge funds are fond of this stock in relation to its market cap peers, it may be a good idea to analyze it in detail and potentially include it in your portfolio. Our calculations showed that top 15 most popular stocks among hedge funds returned 19.7% through March 15th and outperformed the S&P 500 ETF (SPY) by 6.6 percentage points. Hedge funds were also right about betting on TRU, though not to the same extent, as the stock returned 14.7% and outperformed the market as well.